With the number of oil and gas wells TAG has online, waiting to come online, and yet to be drilled, we’ve been upgrading the infrastructure of our Cheal and Sidewinder oil and gas production facilities to ensure that we have the capacity to handle existing and future production. Sidewinder’s compression unit has been installed and is now operational at full capacity with only two of four wells maintaining this capacity. These high deliverability reserves are being conservatively produced at approximately 8-10mmcf/d with the single compressor to ensure many years of profitable operations from the Sidewinder Production Facility. The Production Station has been purposely built in modules that will allow further expansion should drill results (we hope) warrant. 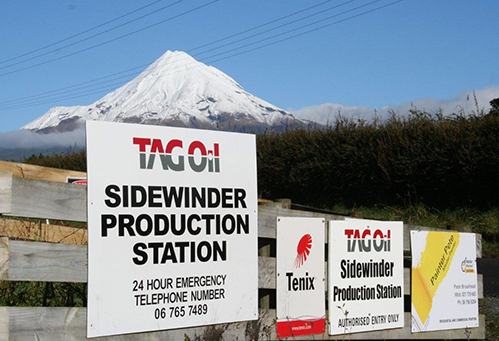 Sidewinder Production station entrance with beautiful Mt. Taranaki in the background. Here’s the new compressor being fine-tuned. 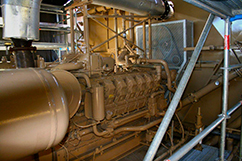 This is the unit that should increase field production to 8 to 10 million cubic feet of gas per day in the near future. 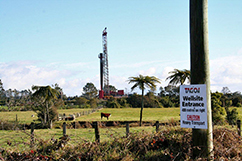 An interesting shot that shows our neighbor Greymouth Petroleum and the Tiger-1 drilling rig in the background; gives you a feel for how close they’re drilling to TAG‘s property. Warren Buffett and TAG Oil together in a Forbes post: That’s what we call good company. In a recent post about TAG Oil as a good “buy” opportunity, Forbes online says “…investor Warren Buffett advises to be fearful when others are greedy, and be greedy when others are fearful.” They point towards one way of measuring fear levels via the Relative Strength Index (RSI), which measures stock momentum on a 100-point scale. Indeed. Since we can’t control a volatile global stock market, we can at least appreciate these opportunities when they come. See the full Forbes story here.